I may or may not be basing this on my actual friend Eugenia who wants to live vicariously here. OK, we know James had some pretty good furniture to start with. 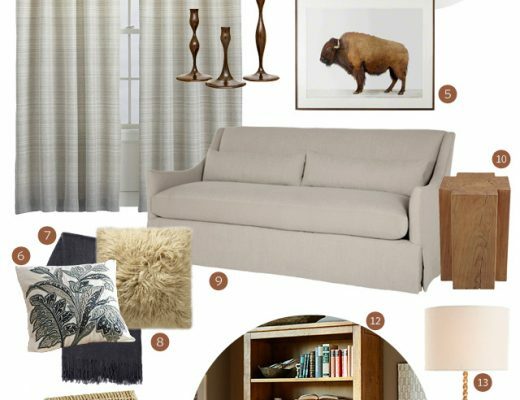 The mid-century rocker is staying since we’re basing each room around it in this edition of Making it Yours. 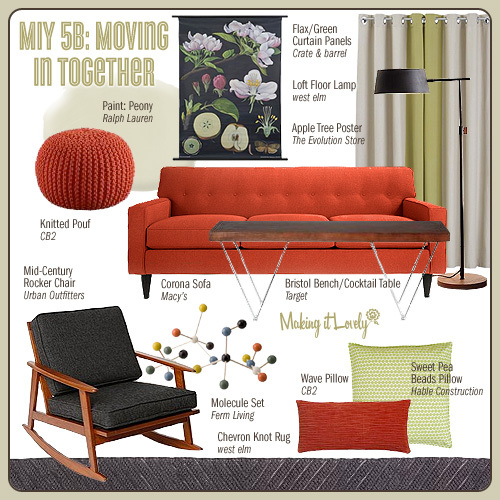 We’re also keeping the sofa, orange pillow, pouf, lamp, and table. The molecule set is staying too, and we’re adding a vintage-style apple tree biology poster. * Eugenia and James painted the walls green, added some new curtains and a pillow, and put down a soft new rug to make the place feel like home for the two of them. James and Eugenia will be moving the rocker into their bedroom soon, so when we check in on them again we’ll see how they’ve incorporated it. * Did you know that apples don’t come true from seed? Apples are pretty interesting; read The Botany of Desire if you’re curious. My life has never been so wonderful! I’m like this guy. Oh not so many changes as I expected, keeping the chic style of the look. That print is the perfect touch Eugenia could give to this living room. Is James a Clemson grad? If he is, I’ll bet he has an orange Volvo in the driveway!! I love that you posted about this because my BF LOVES orange and I always worry that when we move in together that decorating will be a big pain. See, I LOVE purple and can’t really stand orange so we will see how it goes! Is the mid century rocker at all comfortable or are you basing this choice merely on aesthetics? 1. I’m certain I went to college with this entire cast of characters, including the Marxist ex-boyfriend. Especially the Marxist ex-boyfriend. My BIL looked like he wanted to crawl under his metal folding chair. My SIL would have joined him, had she not been laughing hysterically. I miss having lamps and coffeetables and endtables. They are now trying to pull the art from the walls. My toddler boys have eviscerated all style from my house. i just love what eugenia’s done with the place. great characters, too. I don’t know, Eugenia. 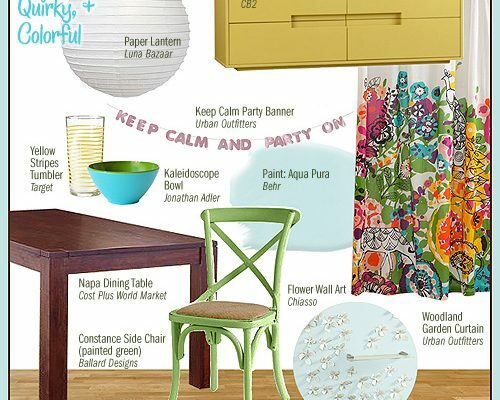 With this tight of a color palette, this latest boyfriend might be a bit of control freak, too. (The orange/sage/gray combo…hmm. Need another color in here to loosen it up?) But I do love that table..and from Target! Love the pieces they have so far! Love the storyline. Just. Love. 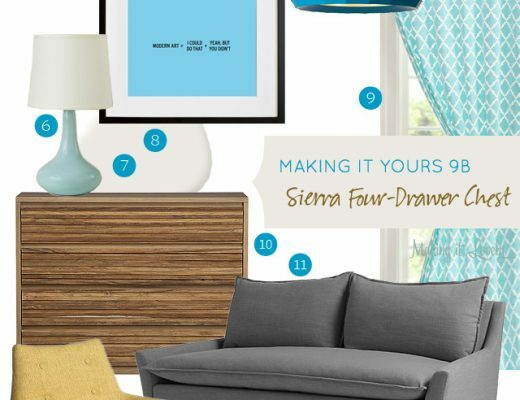 Loved this mood board–I thought one of your very best, so I included it in my “favs”, today, July 9 with a link back to you. Here is a link to check it out. If you click on the headline, you can view the post in full screen mode. I love these series of Making It Yours,it’s so smart idea. It’s also great practice in decorating,right? Those knit poufs look great, and they’re pretty afforadable!